We can’t hide the fact that, since 15 years, watches have drastically increased in terms of dimensions – in thickness for sure, but mainly in diameter. 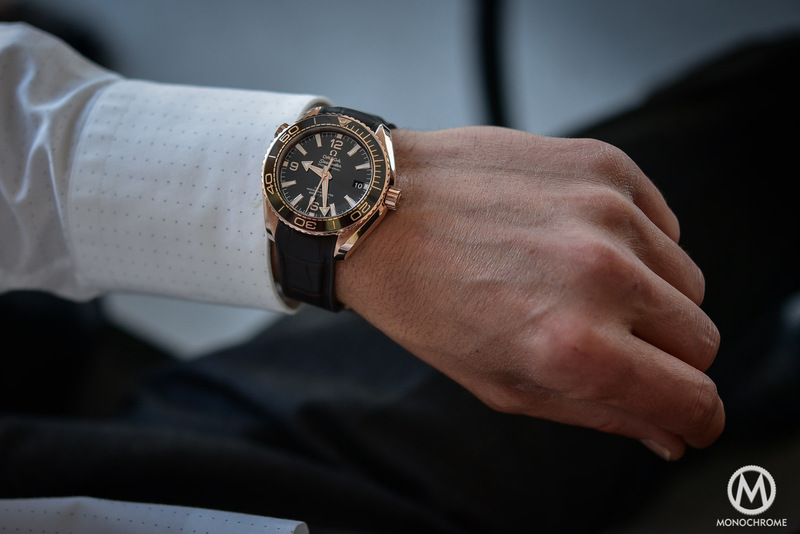 It is now common to see a dress watch with a 41mm case and a dive watch with a 44mm diameter. This is kind of a norm nowadays. Or maybe it was…? More and more, we see watches being downsized. New generations of existing models are going smaller – not hugely, but slowly diameters are stagnating or even decreasing. Do I think that smaller is better? Yes. 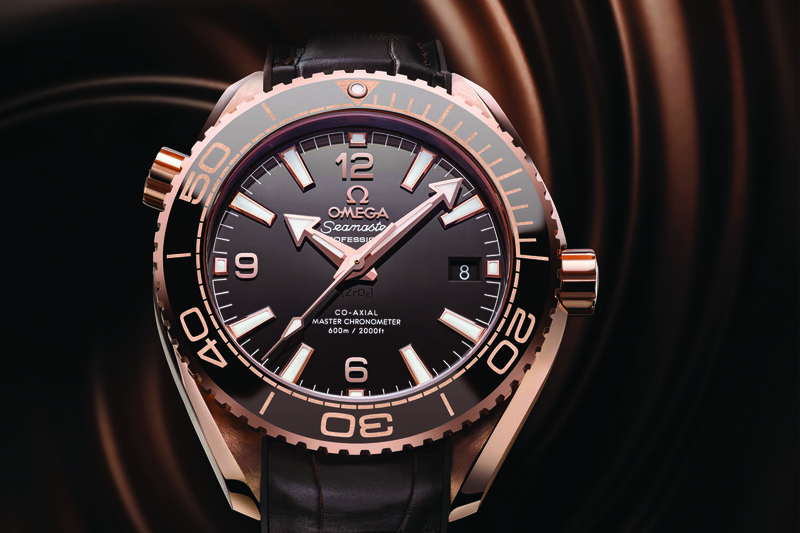 And to demonstrate this, let’s look at the Omega Seamaster Planet Ocean 600m in its new 39.5mm version. 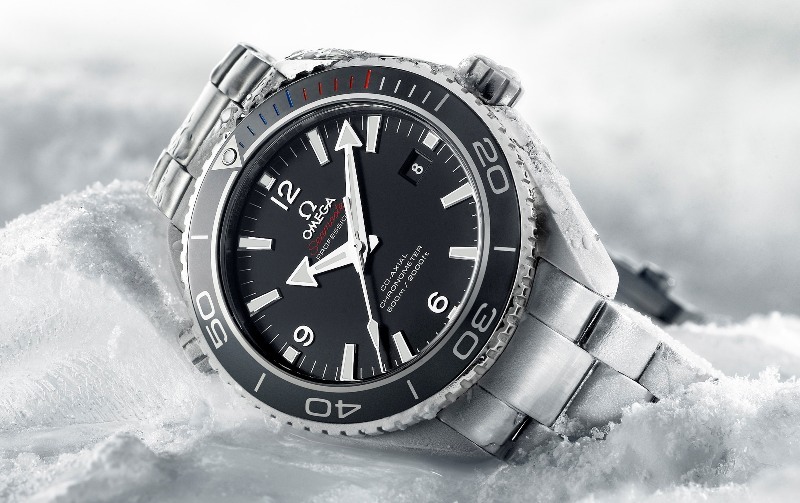 This year, just before Baselworld 2016, Omega announced a new collection for its iconic dive watch, the Seamaster Planet Ocean 600m – a rugged dive watch, with professional specifications, capable of being used and abused by proper divers. Because of this vocation, this watch was previously available in 42.5mm and 45.5mm cases, both relatively thick (over 16mm), simply because we are in front of a dive watch, meaning a strong case, with additional rotating bezel. 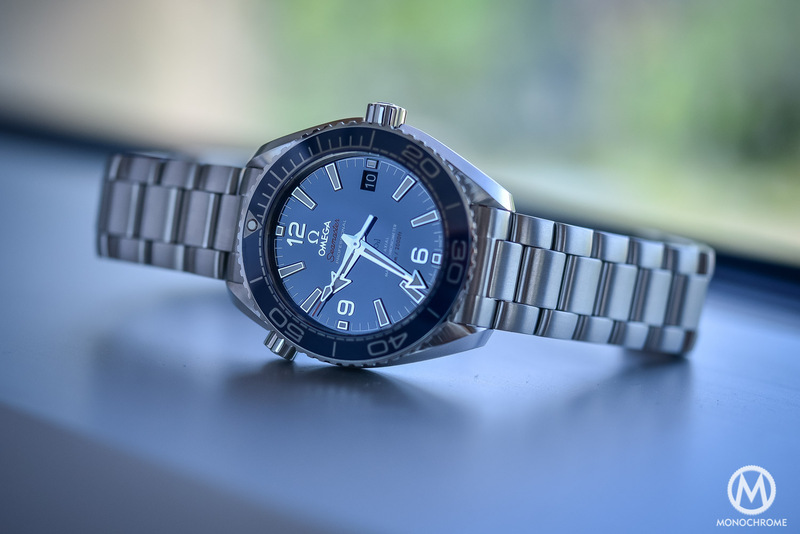 But additionally, Omega showed to us a 39.5mm version of the PO 600m, which, after reading at the press release, was intended to be a ladies’ watch – something that most of us, watch journalists and bloggers, immediately denied, to call this watch “unisex” or even to be the perfect size for a daily use. Just for the story, the Planet Ocean already had a ladies’ version at 37.5mm. Why am I going there? You see, if I take myself as an example, I do have a small wrist. I’ve measured it several times and, that’s a fact, I’m below 17cm / 6.7inches – and no worries, I’m not complexed. However, I can ensure you that I’m not the only one in this case. On certain markets, such as Asia, it is known that the average size of the wrist is lower. Thus, the demand for smaller watches is also following the same trend. But this is not even the central point here. Even if you have a larger wrist, is a 46mm watch the best option, especially on a daily basis, in a business environment? Not sure – and that’s a fact that the head over me, Frank Geelen, will validate. 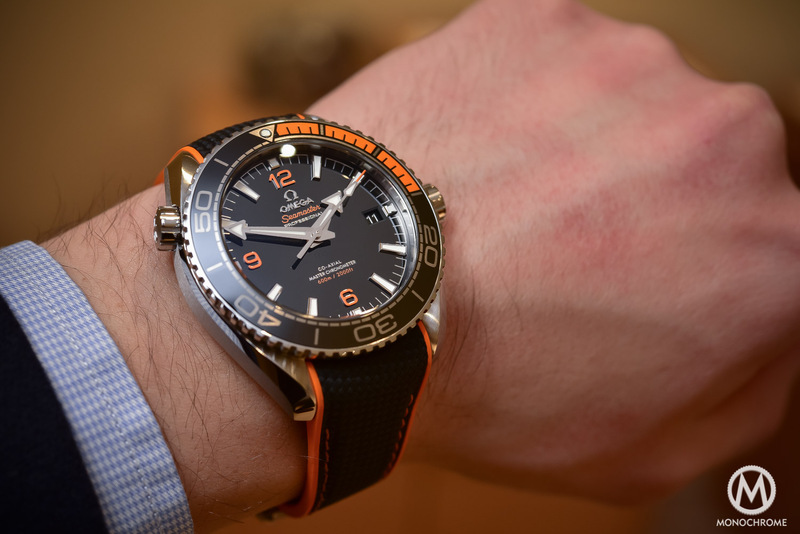 Back on the point of interest of this article, the 39.5mm Omega Seamaster Planet Ocean 600m. When we received the news prior to Baselworld 2016, we, at the redaction of Monochrome-Watches, immediately thought that this watch was not going to be a watch made for women only. Indeed, 39.5mm sounds like a nice diameter… for a man. 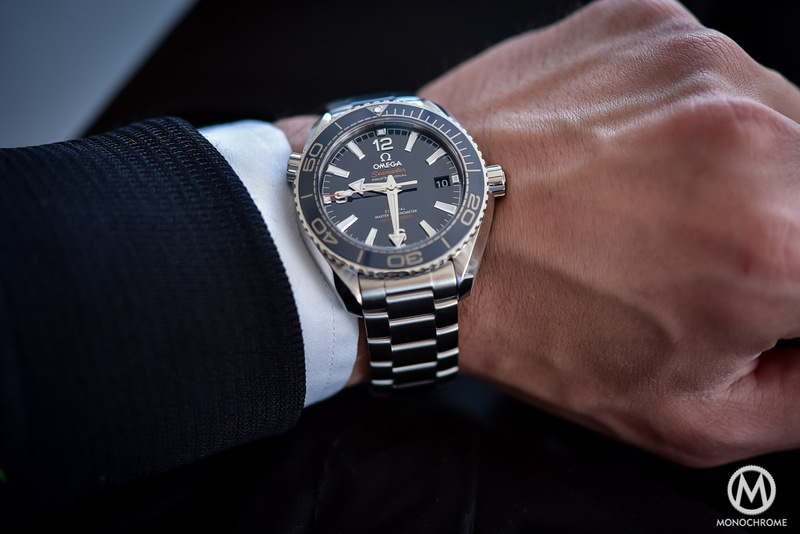 This was definitely worth a try – a try that I extensively had, when Omega showed us the new Deep Black version of the Seamaster Planet Ocean. Well, the comparison was difficult, as moving from a 45.5mm watch to another at 39.5mm. That’s 6mm less, and in the watch world, it’s like going from a Bentley SUV to a Lotus Elise. The most surprising is that, in the end, we are talking about the same watch: same overall design, same dial, same bezel, same case, same vocation, same display… Same but better? Maybe not better, but clearly more to my tastes, and here is why. I do prefer the 39.5mm Omega Seamaster Planet Ocean 600m because it’s more comfortable, especially when worn on the metallic bracelet. Well, a watch is supposed to wrap around your wrist, not to sit on top of your wrist. When you take a 45mm watch on a wrist like mine, it does not embrace the curvature of the wrist. You have a void under the lugs that creates and makes the watch potentially unbalanced. With a smaller watch, the caseback sits on the flat part of the wrist and the bracelet or the strap sits flat too, at its beginning, to then wrap around the wrist. This is the comfortable position. And to obtain that, you need to try watches and to see what is the size that suits you better. 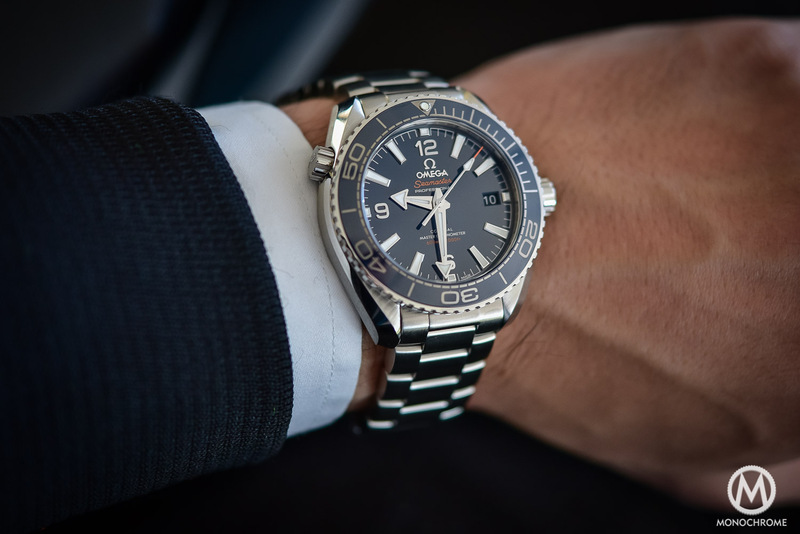 For the Omega Seamaster Planet Ocean 600m, in my case, the 45.5mm edition is clearly way too large. The lugs simply outstrip my wrist and the strap / bracelet has to go down straight at 90 degrees. The 43.5mm begins to be better and, if I take this watch on the rubber and fabric strap, it feels even better. However, the best option in terms of comfort clearly, undoubtedly, is the 39.5mm. Look at the photos and you’ll understand why. No need to explain the comfort in words. This is visible when worn. Then comes the question of the elegance – more subtle, more personal. 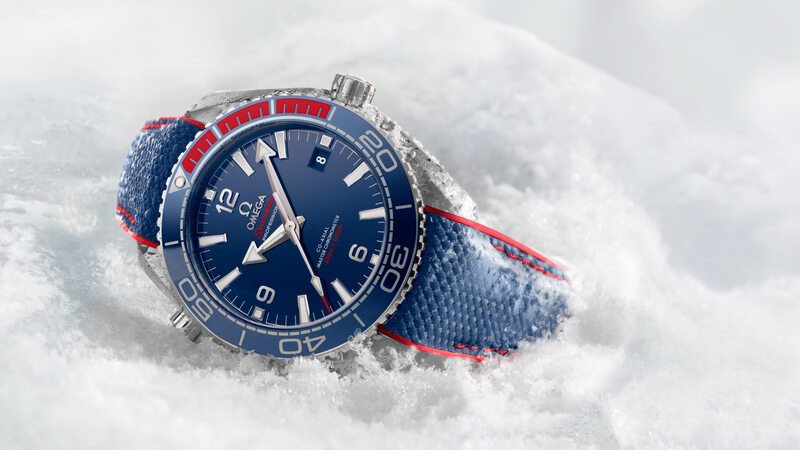 This might sound a bit trivial to talk about elegance with such a dive watch – because yes, the Omega Seamaster Planet Ocean 600m is first of all a very efficient dive watch. However, you’d be wrong to forget about it, simply because most of the owners will wear this watch at least during weekends or even on a daily basis. Few of them, if not approximately none, will use this PO 600m as a real diving instrument. What does it mean? You’ll wear this watch on holidays, during trips to the seaside, at the beach, at the club or even for professional meetings. Then, elegance and discretion are two important factors. 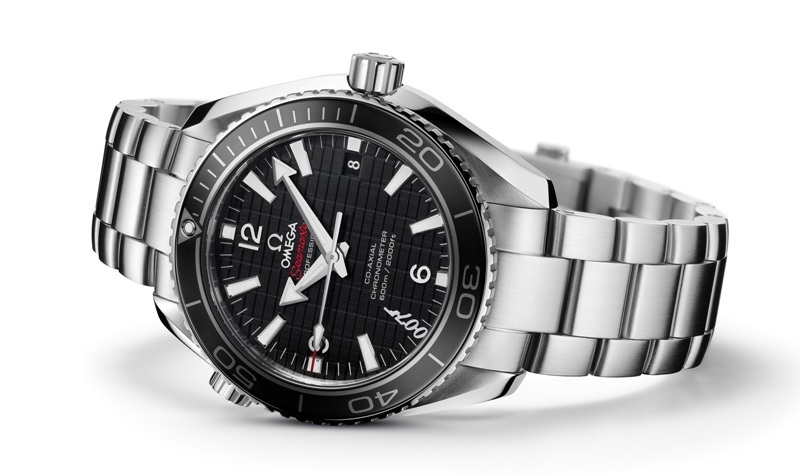 And here, the 39.5mm Omega Seamaster Planet Ocean 600m makes a lot of sense. It is not a matter of design here, because we told you, 39.5mm or 45.5mm editions share the same overall look. It is a matter of proportions and look on the wrist. Except if showing off is your thing – no judgment, to each his own – a bit of discretion is never bad. In most circumstances, being discreet is seen as a mark of good taste. The Seamaster PO is already a rather bulky watch, with a large bezel, large indexes and large hands. Even in this 39.5mm edition, it has a 14.16mm height – and over 16mm in the 43.5mm version. So combining this with a too large diameter might not be very elegant. Then, there’s the visual perception. Do you think that having a jacket in XL if you size M is elegant? Well, it might be the same for a watch. A 45mm watch on a 16cm / 6.5 inches wrist looks too big. No debate. The same kind of observations can be made for the aesthetics than for the comfort. If the void created between the lugs and your wrist is not helping to balance the watch, it won’t help this watch to be elegant either. 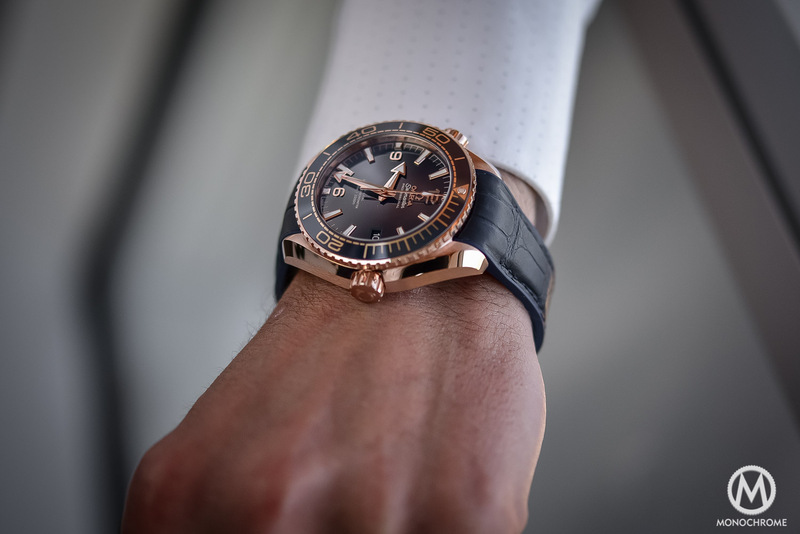 If the lugs exceed your wrist, it will (that’s my personal opinion) be seen as if you borrowed your 2m high friend’s suit… not very sharp looking. interesting reading indeed, I agree on many of the points you raised in the article. The fashion for oversized watches was clearly – at least to me – just a temporary trend. In my opinion it was started with the rebirth of Panerai (which – by the way – is the only traditionally big watch toghether with some similarly traditional pilot’s – thus “autohrized” to make huge watches). This said, it makes anyway sense for a technical watch such as a diver to be big – both to allow a stronger case and a better dial reading. 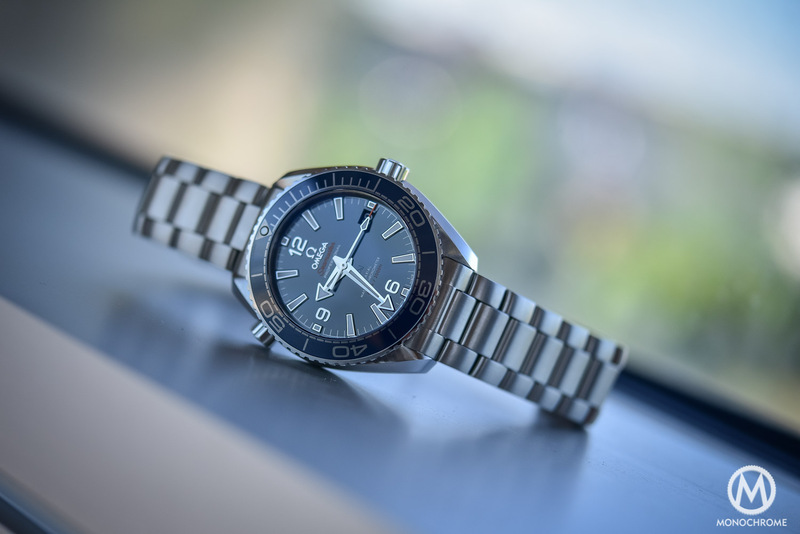 I am curious to see this watch in the flesh, I own a steelfish superocean wihich at “only” 42 mm is actually very wearable – even in business environment – so I’m sure the Omega would be even better and thus a daily beater. Thank you Brice for your interesting article! What has not been mentioned is the size of the movement. Is the Calibre 8800 in the 39,5mm Planet Ocean as big as the gents-movement Calibre 8500? Or is it a new version of the ladies-movement Calibre 8520? I noticed that the 8800 has “only” a power-reserve of 55 hours, while the 8500 runs 60 hours without winding it. For me it makes a difference. I am not sure if I would like to wear a Planet Ocean with a ladies-movement, although the watch-size of 39,5mm would also fit to my wrist-size. 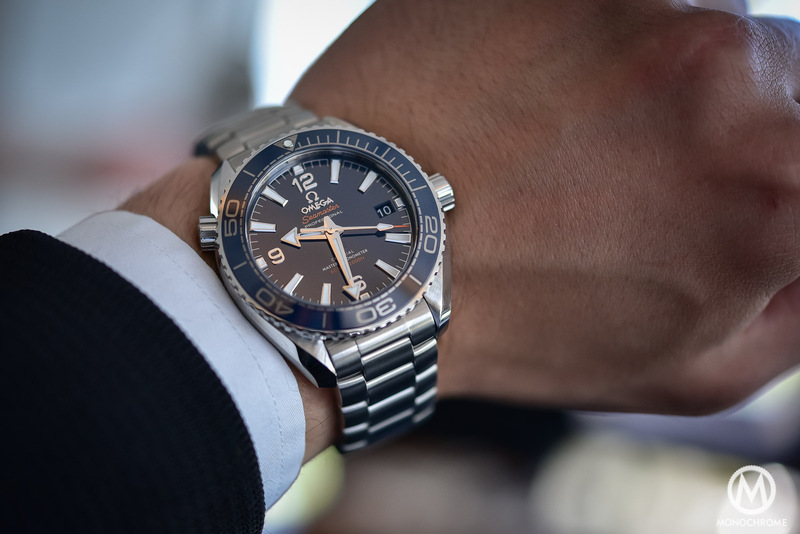 I own a 42mm Planet Ocean and I like it very much for sport-activities or during my holidays. For business I find it somehow too sporty and hefty. It is simply a true sports-watch, also because of its case-thickness. Normally I like watches with a smaller size, but the 42mm-Planet Ocean is a great summer-watch. Solid, reliable, perfectly legable! 40mm PO for a man is a joke. Bigger presence is a part of planet ocean’s charm. Small PO looks wierd. I don’t like oversized (45+) watches myself but these days watch is an accesory. Everybody has time in their phone. Slightly bigger size gives you extra presence. The “understated” trend is silly. Why spend few grand on a watch and hide it? That’s why ladies watches grew in size! If somebody wants a classy timepiece, buy a proper dresswatch. Planet ocean is a tool watch. agree that the size watch one wears should be in proportion with ones wrist, but i also think it should correspond with the intended purpose. A watch like the Planet Ocean is not meant to be worn under a shirt cuff , its meant to be robust and visible, not to show off as the author suggest, but to be practical for its intended purpose. 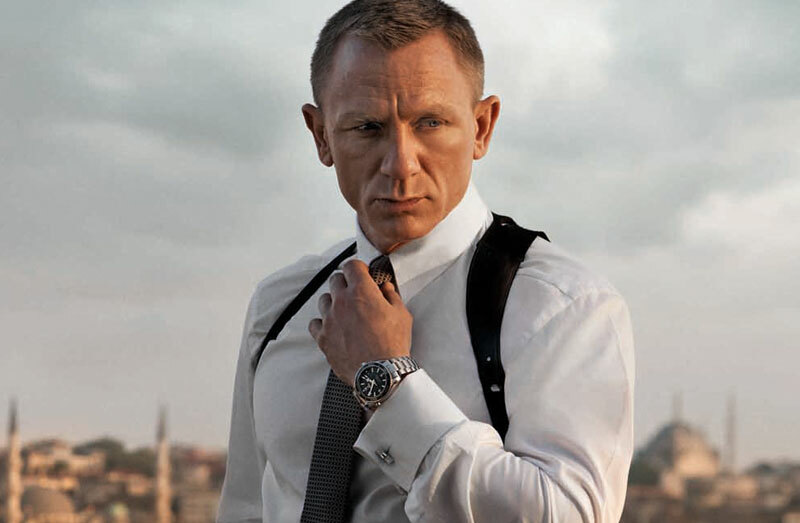 The problem with current trends is not watch sizes its the idea that every watch should be worn with a suit. While I agree with a lot of the statements in this article, I think the conclusion is simply wrong. It is obvious (or at least it should be) that a 47mm Panerai is not the pinacle of understatement and elegance. But both aspects are just two among many that define the look or effect of a watch. So, if the focus is on understatement and elegance, smaller may be preferable. Then again if highly doubt anyones judgement who wants such a watch and then goes for a Planet Ocean. No matter what size, a Planet Ocean is not a watch that pulls of Understatement so judging it mainly by this metric does not seem to be the most wise of choices. Let me add just one aspect to the general discussion about watchsizes. There is no general “right” size for everyone!!! Lets take your 17cm wrist and compare it to my 22cm. Those transfer into a 5.4cm diameter for you and 7cm diameter for me…that is a whooping 1.6cm difference when looking from the top. Taking those numbers into consideration, it becomes easy to see why the Gray Side of the Moon (44.25mm) actualy works well as an elegant watch for me (=case and band flat on the wrist, plus a fingers thickness distance below and above the case and the outer egde of my wrist when looking from above) while for you it would most likely be very different. To me this is really individual. Some wrists look weird with a small watch, some fine. Same goes for bigger watches. Of course nowadays we see some designer watches which have a 50mm case and that’s more fashion than anything else. To me, a 43.5 Omega Planet Ocean still looks perfectly fine on the right guy. What I found funny, the author writes: Except if showing off is your thing – no judgment, to each his own – a bit of discretion is never bad. If “Except if showing off is your thing” is not judgmental, then I don’t know what is. 39,5 mm is just fine for smaller wrists . Mine is 16.5 cm and the 42 mm iwears too big. Don’t forget that the iconic Rolex submariner is 40 mm ………..
As an owner of the 45 mm and 42 mm versions of the PO, I appreciate these aesthetically and technically. Still my POs gather dust in favor of a more comfortable daily wear (usually a Submariner 114060). And, at 61 inches tall and 170 pounds in weight, I am a fair sized man. I will happily trade out my 2 POs in favor of a version I can really wear. Want a real tool to dive ? Today divers use dive computers (Mares, Scubapro) featuring algorithms, gas mix planning features etc. They cost a fraction of “dive watches”. Forget about Planet Ocean or Sub. Dive watches today just reflect an attitude, a style. And that’s alright. As for size, I like my 42 mm dive watch when wearing a T shirt or when swimming, and with a suit I wear a fabulous 35 mm chronograph from 1945, or then a Reverso. I have both the 39.5mm PO and the LN Sub, and they perfectly fit my 7″ (17.8cm.). Regarding the discussion of larger being better for a diving tool, this from the article rings true: “Few of them, if not approximately none, will use this PO 600m as a real diving instrument.” Agreed. Thanks to PO for producing a smaller/retro size. It feels like a classic. I think you are forgetting another critical measurement as or more important then the case diameter and that is the lug to lug or total length from the end of the lugs. That will determine how well it fits on the top on the wrist. For the PO 39.5 that is 45 mm, PO 43.5 it is 49 mm and for the previous version PO 42 mm is is 48 mm. I think these are accurate but have not measured myself. Also for diver watches the actual dial size will always be smaller due to the rotating bezel. And this effects the look of the watch. I do agree, Rob, but brands never communicate on lug-to-lug measurements and we only get to handle a selection of all new watches. Even with lug-to-lug size you cannot always determine how comfortable it wears as it’s not an exact science. This is the reason why we often say something about short lugs or long lugs and describe how it wears.